Heavy gauge Galvanized wire was used, and now it is lying in the bush, and has caused many moose and other animals from getting tangled up in it. Since the value of the wire isn't that much it has been left behind. Something should be done about it, but would be a costly venture I am sure. Maybe need some good hearted soul to walk the whole line and cut the wire into short pieces as they go. Less chance of it causing an environment problem that way than one long piece. Be better if it was hauled out in one chunk. Connected with the CPR line at Ashcroft. 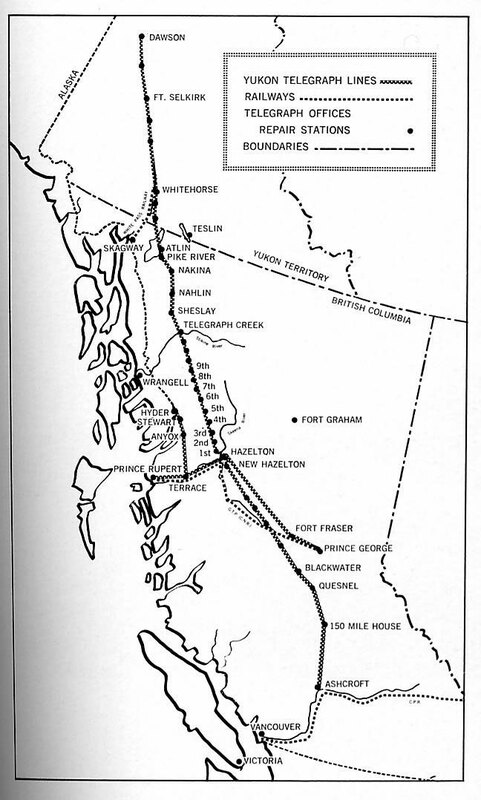 Sept 1911, W. W. Wrathall announced the telegraph line from Kitsumkalum to Stewart was completed. the price for a message 10 words long from Hazelton to Stewart cost $1.25 in 1911 dollars!